You’ve decided to volunteer at the Muleshoe Bend 60k outside Austin, Texas this July. Everybody says you can learn a lot about how to race well by helping runners at an aid station. And you’ve got your first ultramarathon coming up. You want to know what works and, more importantly, what doesn’t. And, of course, you want to build up trail karma. Muleshoe Bend starts at 7 p.m. because it’s a bit less hot in the evening than it is during the day in South Texas. A bit. Really it’s just less sunny. It’s still 92 degrees Fahrenheit when you get to the aid station. And, of course, it’s humid. (If you haven’t run in South Texas in July, you can simulate the experience by standing in a hot shower in your running clothes and a wool hat. Then wrap yourself in a wool blanket and run uphill. You fill runners’ water bottles with Tailwind and ice, and you scoop ice into ice scarves, hats, hydration packs, arm sleeves, and sports bras. You make mental notes to sew yourself an ice scarf for your race and to make sure to bend over when people dump water on your head, so the water doesn’t run into your shoes. Good times! Then Rich walks into the aid station. He’s a well-known runner and beloved, and all the volunteers yell out his name when he arrives. He doesn’t smile. He’s drenched in sweat and his clothes are plastered to his body like all the other runners. But he’s also very pale. In fact, he looks sick. He walks over to a camp chair, sits down hard, and puts his head in his hands. Try to answer each question before reading further. What is wrong with Rich? What three actions should you take next? Should Rich drop from the race? Rich’s symptoms could be caused by a whole slew of things. You’re not a doctor. But when someone’s running in 92-degree-Fahrenheit weather, dehydration, heat stroke, and heat exhaustion are solid guesses. Rule out each one before doing anything else. Rule out dehydration: Ask Rich if he is thirsty. If he’s not thirsty, dehydration, or low fluid volume, isn’t making him feel so sick. Rich says he’s not thirsty. Rule out heat stroke: Rich isn’t disoriented. He’s speaking in full sentences and he answered your question about thirst. He walked into the aid station slowly, but without trouble. So you can rule out heat stroke. Your brain is literally being cooked at 104 degrees Fahrenheit or higher with heat stroke, so Rich would be confused, disoriented, or have a decreased level of consciousness. His ability to run or walk would likely be uncoordinated. Heat stroke is a life-threatening emergency. Take a look at this video of a Calum Hawkins at the 2018 Gold Coast Marathon to see an example of a runner with heat stroke. That leaves us with heat exhaustion. Heat exhaustion is simply an “inability to cope with heat stress.” It’s a big umbrella term that covers a range of symptoms. That wiped-out feeling you have after a long day in the sun that fills you with apathy for everything except lying on the couch is heat exhaustion. Heat exhaustion can also look like Rich. Unlike heat stroke, heat exhaustion may feel bad but it’s not a medical emergency. And, really, the only way to rule out heat exhaustion is to treat for it. Put Rich in the shade. If you have ice, put it in bags, and place those bags around his neck, on his torso, and in his lap. If you don’t have ice, douse Rich in water and fan him. Don’t let Rich generate heat. Ask him if he’d be more comfortable lying down. Otherwise, keep him seated and resting. Have him drink some soda with ice when his stomach feels better or give him a popsicle. Cold drinks and food won’t cool him down, but they’ll give him a big mental boost. (Can I get a witness!?!) And it’s not uncommon for heat-exhausted runners to be low on calories because of their nausea. So soda or popsicles can kill two birds with one stone. If Rich feels better after you cool him off and give him some calories, he’s not lightheaded, and you think he’s capable of keeping himself cooled the rest of the race, tell him to get out of your chair and get going! Otherwise, recommend he call it a day and get him to the start/finish. And tell him to take a look at Corinne Malcolm’s heat-acclimatization article for future hot-weather running. The scenario continues: You treat Rich, and he improves. He thanks you for saving his race and heads off into the night. You make some peanut butter and jelly sandwiches, test the M&Ms, and laugh a lot with the other volunteers. Volunteering is great. Then a young guy in a “I love Newfoundland” t-shirt stumbles in. “Woah there! Doing okay?” you ask. What’s wrong with this Newfoundlander? Any runner who is disoriented or has decreased level of consciousness in a hot environment should be treated for heat stroke. Assume he’s disoriented because his brain is cooking at 104 degrees Fahrenheit or higher. Make sure he’s in the shade. If you don’t have ice, douse him in water and fan him. Absolutely not. Anyone with a decreased level of consciousness should be taken to a hospital. Fast. 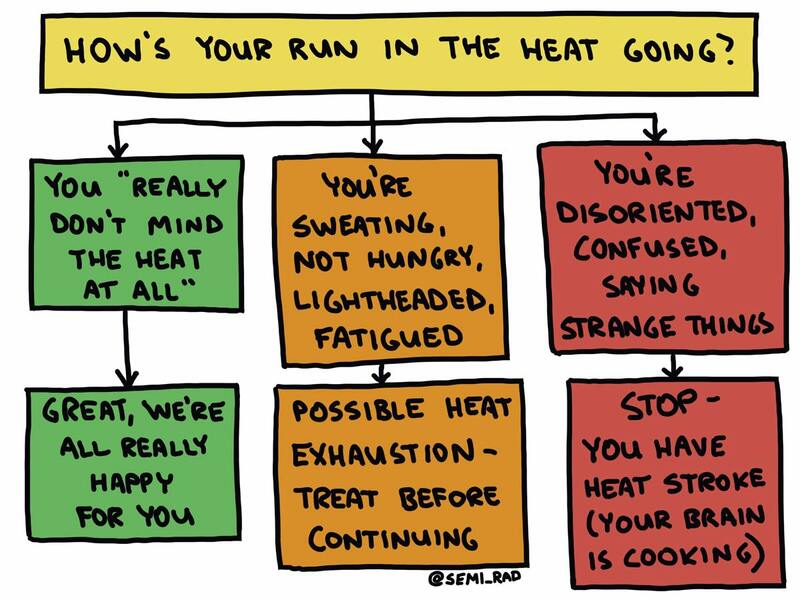 Remember, it’s heat stroke if a runner’s mental status is affected. Treat for heat exhaustion otherwise. And if your common sense is wrong and these folks are sick for some other reason, you can’t hurt them by cooling them off. You’ll definitely deal with heat-exhausted runners when you volunteer at hot races. You’re unlikely to deal with heat stroke because the body does a great job at protecting the brain and keeping you from cooking it. Share how you prevent heat exhaustion at your races and in training. Thanks for writing this article. Its great information for anyone running races at hot times of year. What about hypoglycemia? Symptoms of elevated heart rates, delirium and confusion are common symptoms. How would you differentiate between heat stroke and low blood sugar? I have personally experienced being very hot and confused to have my situation rectified by drinking a coke and choking down a couple of gels. Not trying to minimize the threat and urgency of heat stroke, but I’m wondering if being hot and disoriented by itself is too low a threshold to be initiating ambulances and hospital trips. Hi Karl! Great question. Hypoglycemia could definitely be an issue in this scenario — and during races. Heat stroke is rare in ultras and in marathons. And getting low on sugar is pretty darn common. But because the consequences are so dire and permanent with heat stroke, I think the guidance has to be that anybody who has a decreased level of consciousness when it is hot outside, should be treated like heat stroke. But it’s important to say that we’re talking about someone who’s really out of it. They might not know where they are or who they are. Obviously, you can get that way with low sugar, but that’s not all that common at races. And if someone has sugar that’s so low that they don’t know where they are and are stumbling etc., they should have an ambulance called for them too. Regardless, if someone can hold a soda themselves and drink it, or a popsicle, definitely do that to treat any low sugar like you said. How does that sound? Wonderful article, cuts right to the essentials and keeps it simple enough to remember. Question: when flirting around with heat exhaustion rather than dehydration, and trying to get back into the race after cooling core temperature down, can using perceived effort as a gauge and dialing it back be a reliable means to stave off recurrent heat exhaustion or worse, possible heat stroke. I would worry about feeling better after resting and cooling off in an aid station, and then going back out into the race and getting into deeper trouble even if the effort did not feel harder. Another way of asking, is heat exhaustion cumulative over time leading to heat stroke or reversible as long as it is below a certain threshold? Good question and good concern. I think if you get into trouble with heat exhaustion during a race, it’s definitely possible to feel even worse if you go back out into the heat to finish racing. But it’s also possible you could manage the heat better — ice scarf, slower pace, dipping in rivers, etc etc. and finish the race feeling ok. Be fatigued due to heat is cumulative — the longer you’re out there in it, the worse you’ll feel. But heat exhaustion and heat stroke are entirely different things. Feeling really bad in the heat, heat exhaustion, doesn’t lead to heat stroke — which includes that internal generation of heat. From what I understand, we don’t know why some runners suffer heat stroke and some don’t in similar situations. We do know it’s a rare condition in ultrarunning. Liza’s description about running in San Antonio in July is just about the most accurate thing written in the history of writing. Challenging if not crazy. Thanks for this short and informative article, it will make me smarter and more aware while I’m out there pretending I’m not crazy. Also, great timing as it looks like extreme heat has recently gripped most of the country (i.e. the rest of the country feels like it’s visiting south Texas). Oh, how awful. So much sadness. Condolences to Nick’s family and friends and everyone involved. Would a simple digital thermometer help identify and mitigate the risk? My google-fu research suggests 101F to just below 103F can be normal for a runner on a hot day. 103F to 104F seems to be the threshold into the danger zone. Maybe some rolls into an aid station not feeling good and you could quickly take their temp to get a baseline, get them a cold soda or popsicle and after a few minutes take it again. If their temp is headed down, they’re still thermo-regulating – if they’re stuck at 103/104F or headed higher, time to get the emergency action plan going. It’s interesting that we don’t really understand why it happens (we can’t predict it very well or say why some are affected but not others) and it seems that it’s onset can be quick. Really great idea about the thermometer, Aaron. I think it’d make the situation more complicated for novices than it needs to be — and could potentially slow necessary action. Taking a temperature orally can be pretty inaccurate — especially if someone is drinking cold beverages. But you can rely on mental status to differentiate between the two. If a runner in hot environment does not have a decreased level of consciousness, treat it as heat exhaustion. If they’re disoriented, unsure what’s going on, where there are etc., it’s heat stroke, and they need to be evacuated quickly. The internal production of heat will continue despite your cooling. In the death last weekend, the core temperature was 104 at the scene and had risen to 108 at the hospital despite an ice bath. Good thought but needs to be a rectal temperature. 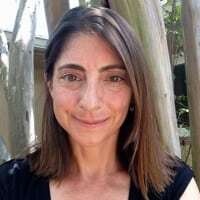 Agree with Liza that altered level of consciousness on a hot day should be treated as heat stroke with rapid cooling in ice baths as quickly as possible. Nicely written article. I live in Phoenix, and right now it’s 8:22 and already 102 degrees. We hit 115 yesterday and will hit 114 today. We deal with the heat from April to November, with the most intense heat being July/August. It’s no joke here. People die every year in our mountains. The key is to adapt to it slowly, to run slowly with a lower heart rate, let go of your ego because you won’t run the same as you did in January, drink more, and when running in the mountain preserves within the city to include stops at trailheads that have water fountains (and hopefully they are cold fountains!). Amen! I’ve been in Virginia this week and, while the temperatures are cooler than in San Antonio, the humidity is a lot higher, and I’ve been running like a slug — and reminding myself to let go of my expectations and deal with adapting. Really good thought about the thermometer, Aaron. But you can rely on mental status instead. Heat exhausted folks will not have a decreased level of consciousness. Heat stroked folks will. If they’re disoriented due to the heat, they need to be evacuated, because the generation of heat internally continues even while they’re being cooled. It was reported the man who died last weekend had a core temperature of 104 degrees in the ambulance “and it had risen to 108 by the time of his death” after being in an ice bath in the hospital. Another quick and dirty suggestion for assessing dehydration: gently pull up the skin on the back of the runner’s hand if you suspect dehydration. If it stays “tented,” get them fluids! They are dehydrated, even if they say they aren’t thirsty.